Woo Hoo!!! Grab yourselves a drink, put on your ultimate party track and make your self comfy!! Well, this party sure has been fun! Checking out all these pretty pictures and inspiration over at Shimelle's - there are some super talented ladies out there!! Well as a party favour from the ever lovely host Shimelle sent me over a .pdf download of printables!! I have NEVER used my home printer for anything other than printing pics - so this hybrid intro was gonna be fun!! I had the entertainment downloads! And I loved them - you can get your hands on them by signing up to Shimelle new class - which starts tomorrow!! over on two peas NOW!!! So what did I do with them? Well after printing them out - I made a Layout!! 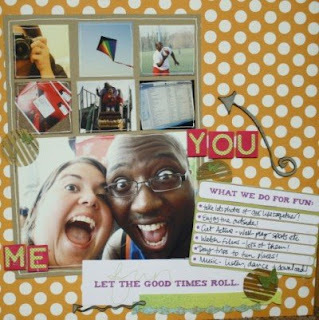 I used the print out as my title for the layout 'Let the Good Times Roll' and used the journalling card 'What we Do for Fun' to create the theme for my layout. I searched through my HUGE selection of photos for some which showed what me and K like to do for fun. These were all mounted on kraft *sigh* bazzil cardstock - and then I found a photo of me and him looking rather well ....silly!! 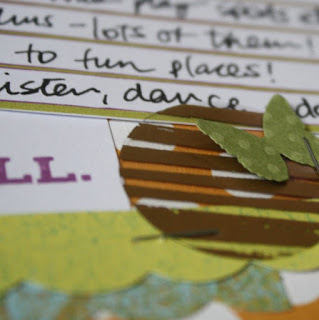 I was super pleased with how quick the layout came together - having the journalling prompts do just that prompt the theme of the layout was great. I managed to use some photos I had but never used - you know the ones. The ones where I want to record my life but how do I then put these on paper kind of photos! Those ones!! So now I have a layout with just a little bit of peek into mine and his life right now, pretty cool!! Anyhoo - Thanks Shimelle for inviting me! And thanks to any party guests dropping by! Hope you have fun and enjoy the rest of the party. 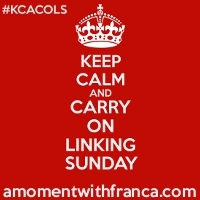 Looking forward to Monday now......as I just signed up to the class too *grin*!!! This is a great LO! 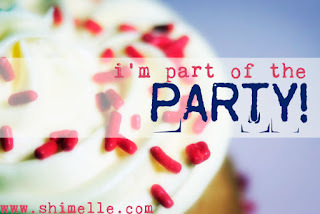 I agree, there are some great ideas over on Shimelle's blog!